Follow Tim on Twitter @timdrake as he live tweets during the Awards! Today is the 2013 SAG Awards! 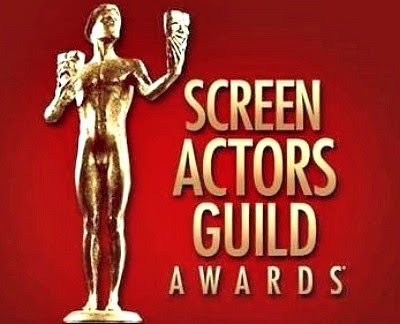 For those of you that are not familiar with the SAG Awards, they are the Screen Actors Guild Awards. These awards are voted on by other members of the Screen Actors Guild. Basically, the the winner of each award was voted on by their fellow actors and actresses. The SAG Awards have a very special spot in mine and Jordan's heart as we have been diligently working towards earning our SAG cards. This years nominations are such a fine class of actors and actresses. When I make my picks of the nominations, I tend to stress myself out over them. I don't know why, but I do. There are just so many great performers to pick from. After my dismal 52% on my picks and overlooking Game Change during the Golden Globes a few weeks back, I took a little more time and watched a few extra shows before todays SAG Awards. Lets hope that I do better this time around. Here are my picks! To find out how I did, make sure to watch the SAG Awards TONIGHT on TBS or TNT @ 8PM ET.